From the time I got to taste this delicious salad many years ago during one of our church potluck dinners, I was hooked. I must admit the first time I saw this salad, I thought it looked weird. Uncooked ramen noodles on top? Really? I’ve tasted so many ramen noodles in my lifetime. After all it’s very popular in Asia, including the Philippines but I have never ever, while I lived there, eaten uncooked ramen noodles. I didn’t even realize that was possible. I have always pictured Ramen noodles floating on a hot and steaming bowl of broth but never on a salad! Setting my preconceived ideas about ramen noodles on salad aside, I decided to give it a try. After one or two mouthfuls, I instantly loved this delicious coleslaw. I was totally surprised at the flavor and how delicious it was! And of course the crunch factor from the almonds, sunflower and the ramen itself was totally great! Thankfully, I found the exact recipe on our church’s very own cookbook. While perhaps many of you already know about this Oriental Coleslaw, I decided to post the recipe here for the benefit of many who like me, previously, never knew that there was a salad like this. Nowadays, whenever I have an Asian themed dinner at home and especially when I am pressed for time – this is my go to salad. Easy to prep – how about 10 minutes or less tops – and of course, it’s reliably delicious. I’ve had many happy reviews about this and also requests for the recipe. So go, make this and enjoy! If you like what you see and would like to receive recipe updates, feel free to join our site or like us on Facebook. Thanks for visiting! 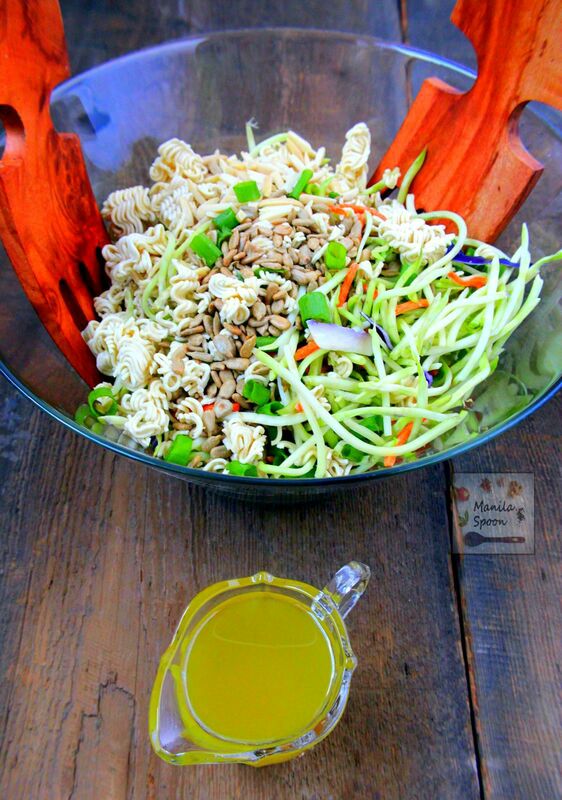 Very easy and tasty salad to make – ramen noodles, almonds and sunflower seeds provide the crunch and the dressing is quite tasty. 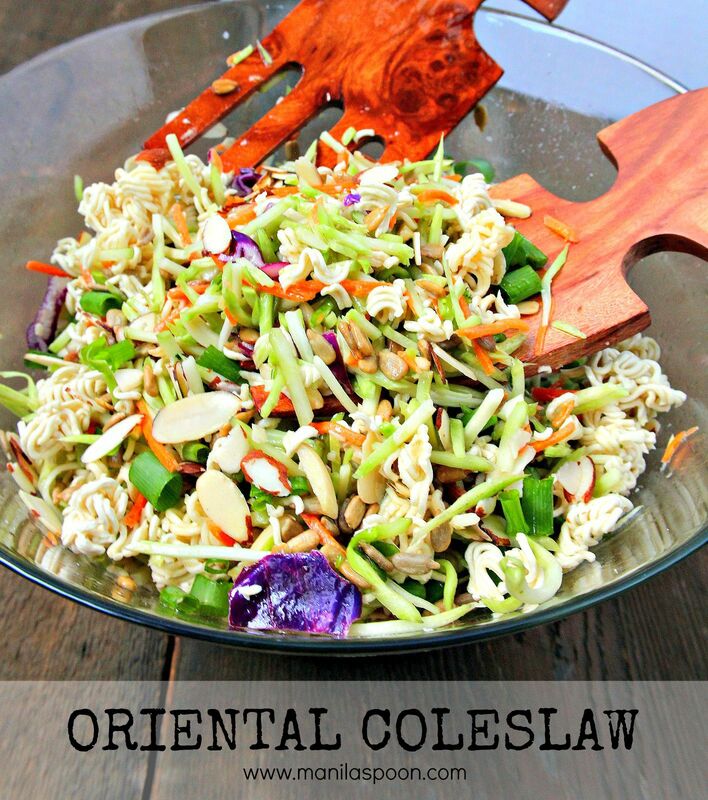 You can’t go wrong with this Oriental (Asian) Coleslaw. 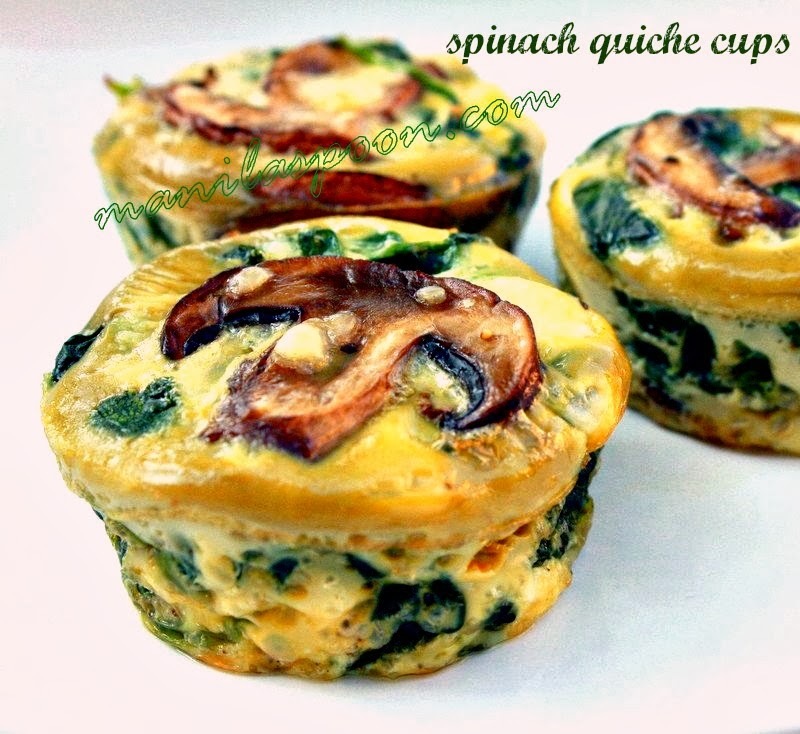 Perfect for picnics and potlucks, or any gathering! 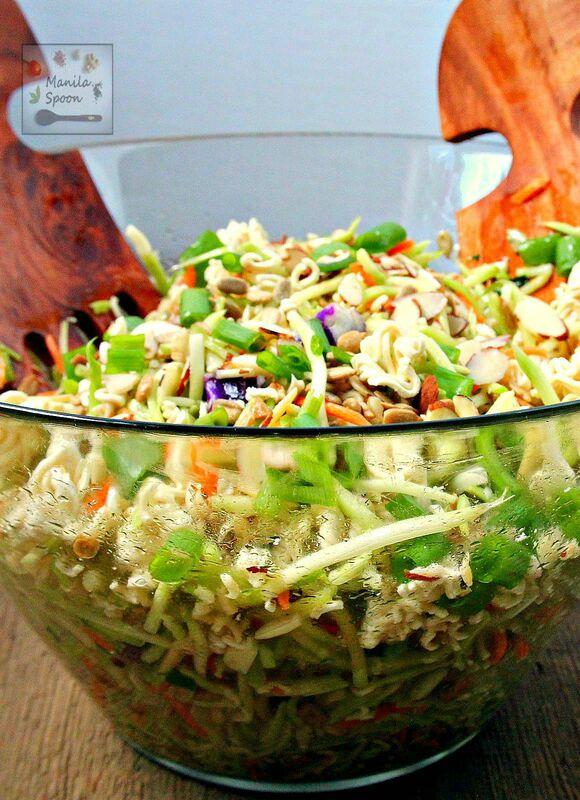 Combine the coleslaw mix, green onions, almonds and sunflower seeds in a salad bowl. Mix the seasoning packet from the ramen noodles with the oil, cider vinegar and sugar in a separate container. Just before serving, break half the ramen noodles into smaller pieces and place on top of the coleslaw mix. Pour the dressing and toss everything to coat. Break the remaining Ramen noodles and scatter on top. Garnish with extra green onions, if desired. Love the brightness of this coleslaw! It looks delicious! I make this all the time….but I use Oriental flavored Ramen noodles. Gives it a better flavor! But I am glad that I tried it and now I am so hooked, Kacey! This looks SO good, I love how you've got a rainbow of vegetables here. The ramen noodles are a must-have for any asian salad! This is my kind of coleslaw! I love the flavors and the extra crunch the nuts adds in! It has all the yummy textures for sure! Thanks, Julia! Me, too Florian! Hope you like it! I have been seeing ramen noodle salads pop up all over the place and now after seeing this one I have decided that I really need to give it a try. This looks fabulous! Des, you really should as it's so yum! Oh how I love a slaw with no mayo!! This one is a keeper! This one doesn't need mayo and it still so yum! Love this! It's been ages since I've had ramen on salad. I actually liked raw crunchy ramen as a snack when I was a teen! I should have done that when I was younger! Oh well, better late than never! Beautiful looking slaw! I love the crunchy addition of ramen noodles. Same here Judy! Love the crunch, too! I know, it does seem so strange that the noodles were cooked. I wasn't convinced until I tried it. You have so many delicious layers of flavor in this salad. Oooooh, this would be great for a potluck! There is so much to love about this dish! Totally making A LOT this summer! LOVE this coleslaw! It would be perfect for Memorial Day!!! Love me some coleslaw this time of year! Can I use canola oil instead of sunflower or peanut? Also, is cider vinegar, apple cider vinegar? I'm making this tomorrow. Thanks! Hi Wendy! Yes, you may and yes, it's apple cider vinegar! Please enjoy and hope that helps! Pinned. Thank you for sharing. I made this and added cooked cold chicken breast, 1/2 cup sesame sticks, 1/2 cup de-shelled edamame, and 1/2 cup wasabi peas. Amazing! Thanks for the recipe. What I do is bake the almond slivers and romen noodles after breaking them apart . Bake at 350 degrees in oven for 5 min or until golden on top and then I put them over the salad after cooled a bit. SOOO GOOOD . Also I've seen this recipe added with soy sauce in it. But I don't think it taste as good. I've also used Olive oil. Kind of whatever Oil you have on hand . IT is good!!! I ‘ve seen this made with Oriental, and Beef Flavored Ramen. I’m tending to think that the Oriental flavor my be more suitable for the dish. Whats your thoughts? I cannot see why it won’t work. Please let us know how it turns out when you try it. Thanks! Awesome recipe! I’ve seen people do the exact same thing but with zucchini, squash all chopped up. It is truly a surperb summer dish! Thank you! I add chicken and use sesame oil. Sometimes I add snow peas. I use regular sugar, but next time I’ll try it with brown sugar. Made this for me and hubby tonight and it was SO GOOD! We have a lot leftover. About how long will this keep? We never have left-overs so that’s never been a problem. Anyway, I, personally, wouldn’t eat at after more than a day because I don’t think it would be as nice as when freshly prepared. The noodles would have gone soggy as well. But if it’s just left-overs for the next day it may still be fine. I am glad you both enjoyed this as it’s truly yummy. Thank you for visiting!